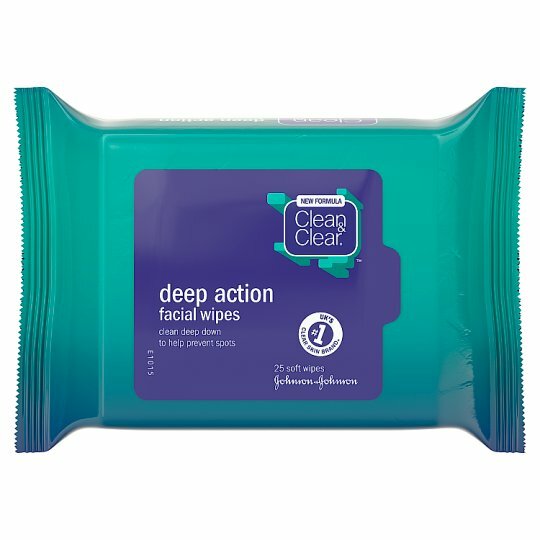 CLEAN & CLEAR® Deep Action Facial Wipes. For clean and clear skin every day in one quick & easy step! Specially formulated to help prevent spots. These daily facial wipes clean deep down into the pores to remove the daily build-up of make-up, dirt & impurities, helping to prevent spots & blemishes. Each wipe thoroughly cleanses your skin and in one easy wipe leaves it feeling cool, refreshed and clear. Directions for Use: Remove a wipe, unfold and gently wipe over face, taking care to avoid the eye area, until all dirt and impurities have been removed. Dispose of in the bin after use. Use as part of your CLEAN & CLEAR® routine for skin that's really clean, clear and under control. CAUTION: FOR EXTERNAL USE ONLY. AVOID CONTACT WITH EYES, IF CONTACT OCCURS, IMMEDIATELY RINSE WITH WATER. DISCONTINUE USE IF SKIN IRRITATION DEVELOPS. KEEP OUT OF REACH OF CHILDREN.